A subcontractor working on the BART extension from the East Bay to San Jose installed 1,400 feet of the wrong sewer pipes under the Berryessa station in San Jose, but project managers say it won't be replaced. A source closely tied to the construction project reported the error to NBC Bay Area's Investigative Unit, concerned the mistake will be an expensive fix for taxpayers in the future. Project specifications call for all underground sewer pipes to be made of PVC plastic, but Skanska-Shimmick-Herzog's subcontractor Hellwig Plumbing installed cast iron pipes instead. Hellwig Plumbing did not respond to a request for comment. Workers were able to replace a portion of the incorrect pipes, but the section under the Berryessa station will remain in the ground because too much work had been performed above the pipes by the time the error was discovered several weeks later. "Metal pipe was used for the water and sewage drains that will corrode, is very rigid and suspect in an earthquake," the source said. NBC Bay Area agreed not to identify the source over concerns about his job. His major concern was that cast iron pipe would not meet the project's stated goal of a 100-year lifespan. Cast iron pipes naturally corrode over time, but the process can be accelerated when exposed to different soil types, water or electricity. It's one of the reasons BART project specifications call specifically for PVC pipe. But the source also said a moderate earthquake could mean the pipes fail much faster because cast iron is brittle in comparison to flexible PVC pipes. "Even though it's going to take a long time to fail, it will fail," the source said. "At that point in time it's going to be exponentially more expensive than it is now to repair." If the repair work is performed now, the source said, the subcontractor would be on the hook for the cost because it was their mistake. But, once the station is built, any future repairs will be paid for by taxpayers. The cost of those repairs will also go up exponentially as an entire BART station is built on top of the cast iron pipes. 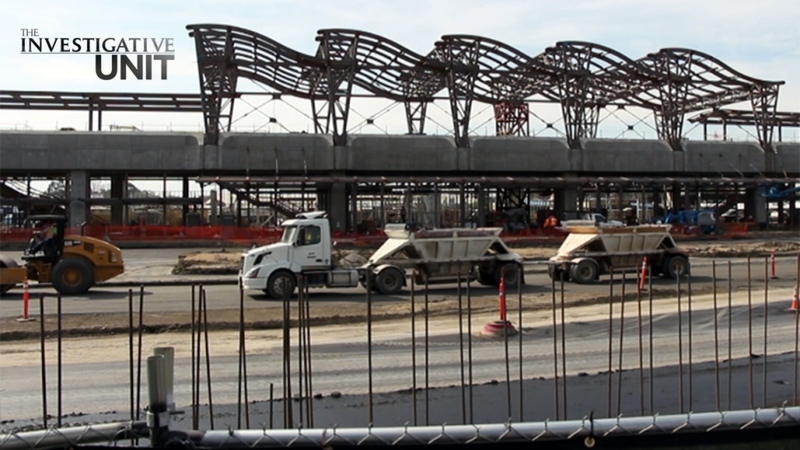 The Valley Transportation Authority (VTA) is in charge of the construction of the BART extension, although BART will take over ownership once the project is complete. A "stop work notice" obtained by NBC Bay Area shows work stopped along that section of the project once the error was discovered several weeks after the pipes were incorrectly installed. VTA confirmed the work stoppage lasted for 70 days. "We flagged it and a stop work order was issued on it," said John Engstrom, VTA's project manager on the BART extension project. "And I think that speaks for itself. We thought it was important enough that it was one of the very few stop work order that we've actually issued on the project." Engstrom acknowledged the error was significant and says that the subcontractor believed it had the discretion to choose the materials under the project specifications. But overall, he said the project is under budget and tracking six months ahead of schedule. He said lab tests performed during the work stoppage show corrosion won't be an issue. "We really don't feel that that's an issue," Engstrom said. "In particular because we did the analysis to see what the potentials were for this to degrade." But engineers who spoke to NBC Bay Area say they're not so sure the pipes will last in an area with a lot of seismic activity, such as the Bay Area. "In this particular case, being in the Bay Area, which is a seismic area, using a flexible pipe like a PVC or some sort of other plastic pipe is a prudent engineering practice as opposed to brittle pipe," said Dr. Samuel Ariaratnam, a professor and chair of construction engineering program at Arizona State University. Ariaratnam traveled to New Zealand in 2013 after a magnitude-7.1 earthquake near Christchurch to work with the city's rehabilitation team. He said the brittle cast iron pipes in the ground across the city were badly damaged during the quake. "They made a very wise decision that they were replacing all of those pipes with plastic pipe," he said. "So they're actually installing PVC and high density polyethylene pipe in those places that had brittle pipe before." "Lessons Learned from Loma Prieta"
Engstrom said although the specifications called for plastic pipes, he's confident the cast iron pipes will perform equally well in an earthquake. "We're not concerned," Engstrom said. "I would say we're equally confident it behaves under those environments as any of the others." Ariaratnam said he's surprised VTA let the error stand after the subcontractor failed to follow the specifications. "Whether it happened in five years, 10 years, 50 years, 100 years, there's a good chance that it could happen compared to other parts of the country," he said. "That's why I think it's very, very important that you follow what was designed from an engineering specification and not deviate from what was proposed or specified." But Engstrom defended VTA's decision to let the cast iron pipes stay in the ground. "We looked at it and said, ‘Well, we can tear it out, that can happen,'" Engstrom said. "But we're going to take out good work to get to this. So you have to ask yourself, is the cure going to be worse than the disease?" Only time will tell how the cast iron pipes will hold up in the future, but the source said he's certain VTA should repair the mistake rather than risk premature failure. "I think they should do the right thing," the source said. "Acknowledge the error like responsible people and repair it now, at their loss as it is their error, instead of pawning if off on the future taxpayer."